Bags, straws, coffee lids, and to-go containers are common items that make up over 8 million tons of plastics that pollute our oceans, posing a threat to both wildlife and human health. Few of our plastics make it to recycling centers — the Environmental Protection Agency reported in 2015that just 9 percent of all plastics were recycled. Experts say the number-one way to reduce plastic waste is to cut back on the amount we use in our daily lives. 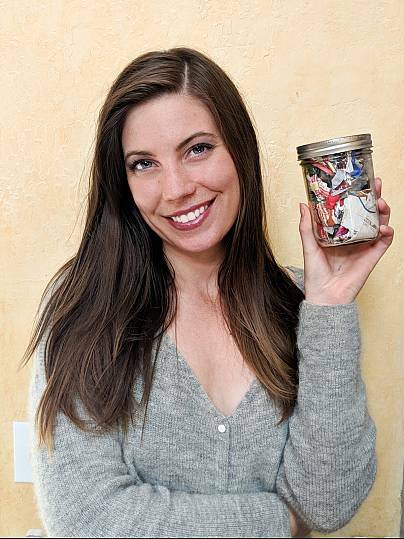 Reducing plastic doesn't only help the environment — it also enriches your savings, according to Kathryn Kellogg, author of "101 Ways To Go Zero Waste." She says she is careful about how much she consumes and makes many of her own cleaning products. "Compared to the average American, every year of zero waste living, I've saved on average about $6,000," Kellogg tells NBC News. What should you cut back? The best place to find out is in your trash can, according to Lauren Singer, founder of the zero-waste blog Trash is for Tossers. "See what you're throwing away," Singer says, "and then pick one thing, find a solution to it, implement it into your life, and once it feels natural, choose something else, and go little by little." Here are eight small tips Singer and Kellogg have for reducing plastic in major ways. Forget paper or plastic. 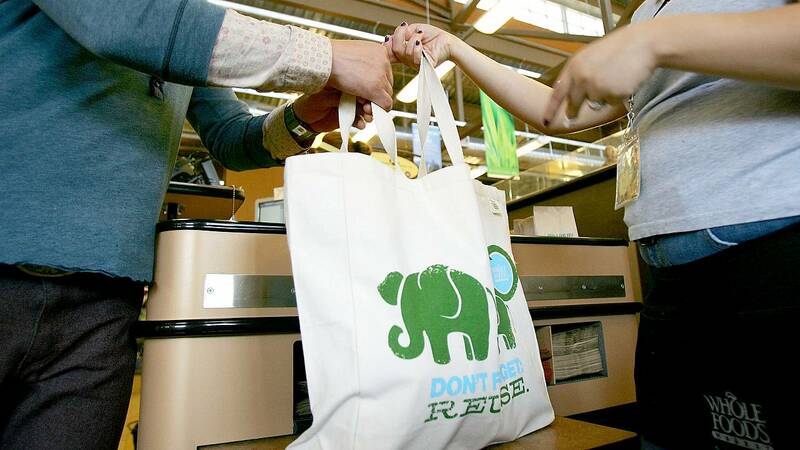 Invest in a few reusable tote bags for your grocery shopping, says Kellogg. Many grocery stores sell tote bags, but Kellogg recommends BagPodz — reusable bags that come in one compact "pod" designed to cover a whole trip to the store, according to the company's website. "They have been my favorite thing because it's just set up perfect for grocery shopping," Kellogg says. You can also invest in separate reusable produce bags for your fruits and vegetables, she adds, which she says can be purchased through many online retailers and in some grocery stores. Singer, who owns Package Free Shop, a zero waste retail store in Brooklyn, says buying unpackaged foods from a farmers' market or all-bulk grocery store (if you happen to live near one) can eliminate even more plastic. "I always go with my reusable bag and my jars for filling things up," she says. When ordering from restaurants and cafes, forgo straws and plastic coffee cup lids if possible. If you have a preference for straws or rely on them because of a disability, both Kellogg and Singer say you can buy a reusable straw made of glass, stainless steel, or bamboo to take with you. They say these and other items like plastic-free toothbrushes can be purchased through online retailers and package-free stores. If you're someone who purchases water in plastic containers regularly, an easy way to reduce plastic is to invest in a water filter. "It's such an easy swap," says Singer. Another great way to reduce waste is to always carry your own reusable water bottle. Most coffee shops will gladly fill your reusable bottle instead of a paper cup, she says. Kellogg recommends a double-wall vacuum insulated stainless steel water bottle. These water bottles keep hot drinks hot and cold drinks cold, she says, while eliminating any need for plastic water bottles, paper cups, straws, and plastic lids. Before you order takeout, call the restaurant to see if they will package your food in compostable packaging like paper or cardboard instead of plastic. Many restaurants are amiable to these kinds of requests, according to Singer. "That's a really great place to start," Singer says. "Just ask if they can package it up in a way that's totally plastic free." If that's not possible, says Kellogg, ask if they will let you bring your own plastic-free containers. Swap liquid soap for package-free soap, usually found in farmer's markets and in some grocery stores, recommends Kellogg. If you want to take it a step further, all-purpose household cleaning products can be easily made at home with a simple water and vinegar solution, says Kellogg, who authors the blog "Going Zero Waste." Makeup and beauty products often come in plastic containers and can be difficult to DIY, according to Kellogg. For Kellogg, an actress who performs regularly in plays, makeup is a necessity. To reduce her makeup-related plastics, she implements a "1-in-1-out" rule. For example, she only buys new lipstick when she runs out, and doesn't buy any beauty products other than the lipstick she needs to replace. "I'm only buying the one thing to replace it," she says, "and that has eliminated so much packaging waste simply because I'm just not buying as much." If you have a home with a backyard, Singer says investing in a composter to dispose your food waste can reduce the amount of plastic garbage bags you use, and is also great for gardening and landscaping. If you're a city dweller, she says, you may need to rely on a local community composting program. Singer, who lives in an apartment in Brooklyn, says she keeps her food waste in a metal bowl in her freezer. "I bring that to the farmer's market every Saturday, and they have a community compost collection program," she says. Cutting back on plastic is difficult, but taking any of these steps is a big leap forward, especially if everyone participates in their own way, according to Singer. "It's not about doing everything," Singer insists, "it's about doing something."